Do NOT mess with the Beefy Crunch Burrito Movement. When it comes to the Beefy Crunch Burrito, Taco Bell giveth, and Taco Bell taketh away. But this time, the fast-food restaurant may have gone too far. Barely a month after bringing the limited-edition item back to the menu after a three-year absence — a move that was hailed as a triumph of grassroots activism by the fans of the beloved burrito, an ungodly concoction of spicy Fritos, beef, low-fat sour cream, and nacho cheese — Taco Bell is threatening to take it away again unless fans like one of its Instagram posts en masse. 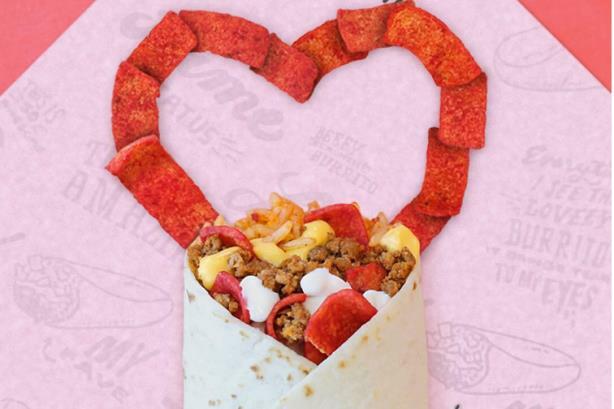 "If you love it, like it," the fast food brand wrote in a post on Instagram last week, "Get this post to 50,000 likes, and we’ll keep the #BeefyCrunchBurrito on the menu even longer." "Why are you guys blackmailing for instagram likes?" wrote selena_rawrs in a comment on Instagram, "It's not even a hard or time consuming burrito to make." Bttfdmc1984 wrote, "It's a shame you make the fans jump over more hoops to keep something they have wanted, to keep it for a bit longer." "Playing with my beefy crunch is like playing with my emotion," said blue_oval_bandit. Wrote kit_caboodle: "Yeah f*ck your like begging. You're going to take this away anyway like you do everything people enjoy." And natelingenfelter added, "Why would you remove it though? Beefy crunch is literally the only reason why I go to Taco Bell rather than Wendys or Micky Ds." In truth, Taco Bell had always been upfront about the fleeting nature of the item’s return, saying it was only back for a limited time. But the post — generated by Taco Bell’s in-house social team, according to a spokesperson at Deutsch, the brand’s creative agency — seems to have crossed the line between playful and manipulative, at least for the thousands of fans who have fueled the movement to bring the item back. Chief among those fans is Richard Axton, president of the Beefy Crunch Movement Facebook group. With close to 42,000 fans, the group has helped keep the item in the public eye, waging a noisy and persistent campaign across social media (Hashtags: #BeefyCrunchMovement, #BeefyCrunchBurrito, and #AnnoyingAF, which stands for "annoying as f*ck.") Axton started the group in 2011 when the burrito was first taken off the menu. According to him, Taco Bell took notice right away and brought him to its headquarters in California to promote a return of the item. "I think the response is an indicator of our community fast approaching a saturation point with regards to 'What we have to do to prove our love for the burrito,’" Axton said. "With five years of going above and beyond, many are tired of jumping through hoops with no real sign that this is heading in a meaningful way." So far, Taco Bell says it is pleased with the response. "We are excited to see the level of engagement our fans and customers are having with this post and the majorly positive feedback fans are giving us, tagging their friends to 'like' the photo too so that all of America can continue to enjoy the Beefy Crunch Burrito a bit longer," the company wrote in an email message. By Monday afternoon, the post was just 500 likes away from achieving its goal, making it likely the Beefy Crunch Burrito would stick around for another six weeks. Whether the same can be said of the fans remains to be seen. "F*ck you for making us trudge through this for an extension of a temporary item," wrote heisenmelon on Instagram, "Taco Johns has a flamin hot cheetos and jalapeno burrito that'll make a decent replacement."